When geese fly in a V formation, they increase their flying range by at least 70 percent than if each bird flew on its own. With two geese behind each goose, they flap their wings in unison, creating an uplift for the bird immediately behind it. When the head goose gets tired, it rotates to the back of the V, and another takes the position up front. 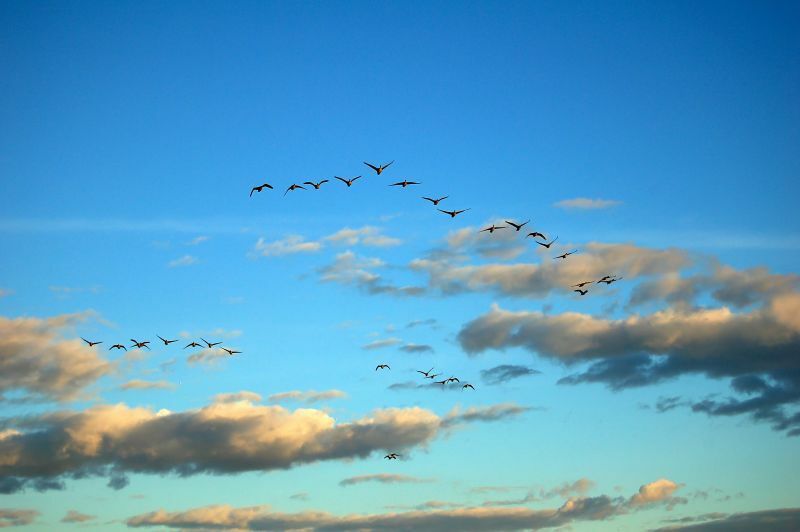 When a goose falls out of formation, it sharply feels the drag and resistance of trying to go alone, and quickly gets back into formation, taking advantage of the collective air current. 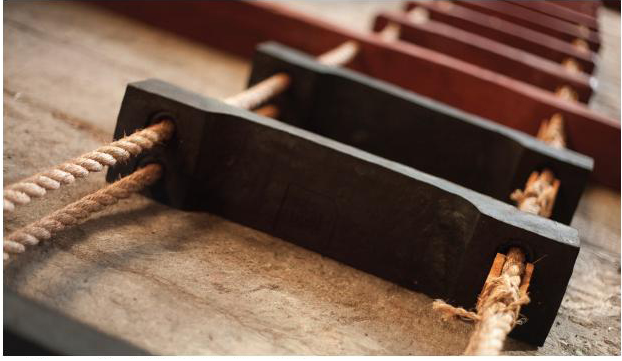 In each formation of Laddership Circles, we experience similar uplifts from the collective. 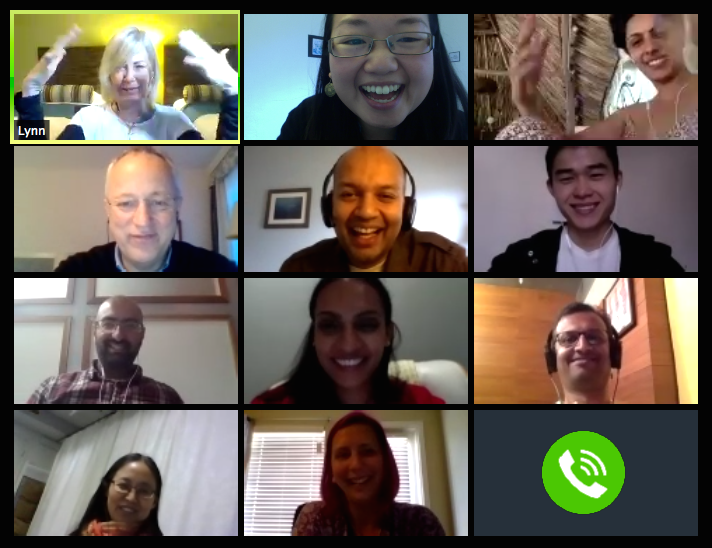 Through online group feeds to real-time video conferences, each 6-week circle unfurls a resilient stream of possibility—one borne from a shared resonance in values and collective conviction in compassionate design. This Spring's circle was no exception. Similar to last Summer, we received an overwhelming amount of interest, and expanded our circle into two concurrent crews. In a thematic progression from personal purpose to systemic designs, each week’s readings and videos, practices and written reflections probed us to re-imagine the lens through which we engage our work and way of being. 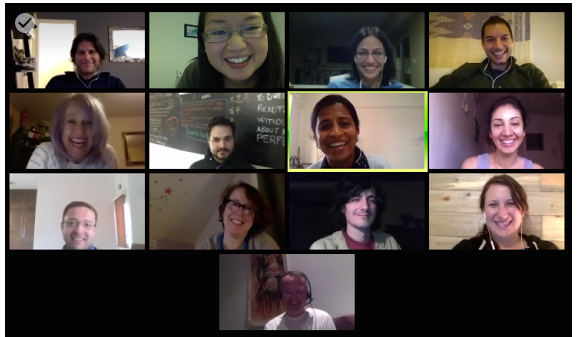 Our 90-minute weekly video calls and emergent breakout sessions cross-pollinated new notions of process, growth, and design from a lens of inner transformation. At the end of six weeks, it’s hard to encapsulate all that unfolded— but here are five (of the many) questions that we find ourselves holding. Question 1: What’s the deeper purpose of innovation? What does it look like to optimize for deeper values like compassion? In our Week 3 call on ‘design’, Parag noted the distinction between being led by ideas versus empathy: "How deeply do we believe in the power of love? I have known the love of power ... but how to seed things in empathy and compassion?" While designing for generosity in London, Shamash wondered how to effectively convey the gifting context. “What language, images, messaging can inspire people to shift toward more compassion?” he asked. 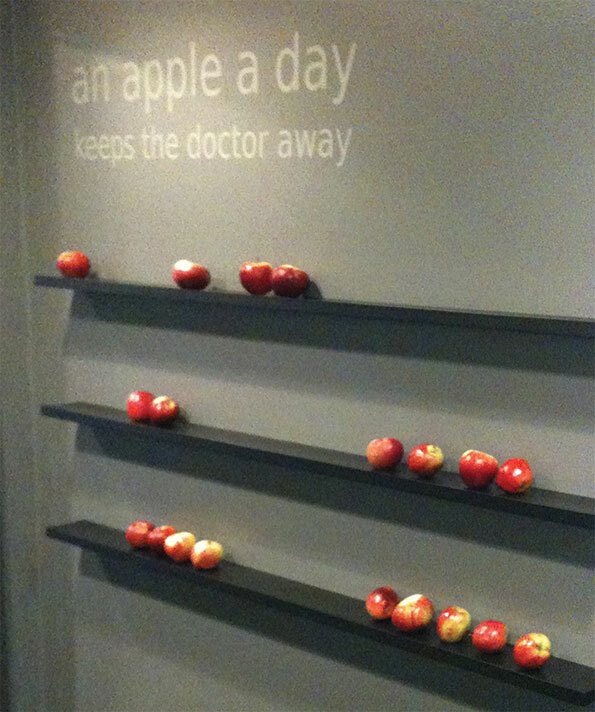 We collectively brainstormed examples—like how at a Denmark hotel, guests chose apples over sugary-snacks when they placed a "apple a day, keeps the doctor away" sign next to it. Or, on organ donation forms, countries with default of 'yes' lead to 97.56% donations, while default of 'no' leads to 22.73%. What is the default for igniting greater compassion? Prasad pointed out that when we design, we can focus on the mechanics of scaling up (efficiency); the relational aspects of working together (effectiveness); or allowing the spirit of who we are to emerge (creating space). And it seems our intentions inform the kind of innovations that unfold. Question 2: How does process inform outcome? Can small, individual acts make a difference? What is the impact of individual efforts within systemic forces? Systems thinker Margaret Wheatley found that post-disaster relief work is more productive with ad-hoc support from well-intentioned individuals than formal organizational efforts. Research also shows that introducing just one consistent contributor tilts the entire network towards more generosity. In our weekly practices, we similarly experienced the transformative power of small acts of goodwill. While in line at a grocery store checkout, Alfred encountered a cashier who seemed to be having a rough day. He gifted her a chocolate Easter bunny, and in the process, viscerally experienced a subtle form of capital emerge as her (and his) energy shifted and expanded. Another week, he was dining in a restaurant with only one server and many tables. Noticing the flustered waitress, he thought, I have to tell her what a good job she’s doing! And as soon as he did, her shoulders seemed to lighten just a little bit—and Alfred himself spontaneously stepped in to help her bring out some orders! Which leads us to our 3rd question: Can organizations be vehicles to practice our values? “There is no such thing as being neutral on a moving train,” Birju pointed out in our second week. When he found himself facilitating a company retreat, he and his colleagues had a conversation on values-alignment – and reflected on areas where their organization diverged from their principles. This prompted a collective decision to raise their minimum wage to $15/hour. Amid travels in Colombia, Harpal dreamed up the idea to create a Travelling Kindness Café—where the appetizer could be a smile, and dessert a hug, and where the venue of the ‘café’ is really just an excuse to engage kindness. And on one of our calls, we witnessed that in action—as Alfred and Natasha dialed in with glowing stories live from Karma Kitchen Dubai! Question 4: Should I be my change or help you be your change? Matt faced a similar question when he hosted his first Awakin Circle in Peru. Having been inspired by one of our weekly videos, he wanted to share it with all the attendees. Yet mid-circle, one of the guests redirected the topic and Matt noticed the energy of the circle derail in that direction. As space-holders, both Wendy and Matt wondered how to respond – should I be the change I wish to see, or blindly support others in being their change? Is one more transformative over the other? In experimenting with these edges, Shamash found that the “concept of creative constraints is really interesting. You think they’re constraining you, but actually, they make decisions much easier.” When his Museum of Happiness organized a gift flash mob with various groups, one partner organization was keen to advertise its name on t-shirts and banners. Yet Shamash’s intention was to keep it anonymous, and this request prompted him to reflect on his values to help determine where to draw the line. Question 5: How can we create the conditions for new kinds of capital to emerge? When asked to write a financial report of her yoga shala, Pranidhi summarized the studio’s finances in a detailed write-up. Then, in the same email, she attached stories of students’ journeys, images, and other qualities experienced in the studio: “The report is the financial capital, and all the attachments are the other forms of capital,” she informed her seed funder. In another instance, Ming in Sweden was blown away by the response of grateful participants after her ‘karma clinic’ workshop offering. “In twenty minutes, everything was done!” she exclaimed, describing how they effortlessly put the chairs away and made the venue look as good as new. "A friend suggested that I make a video about my monastic story. I had written a script and showed it to my friend (a professional film maker) who next offered to shoot the video. He knew that I have no money to offer but he was interested to be a part of the project because he believed in the vision. Next he also pitched the idea to a CGI professional who used to be a monk and is also working on a PhD on Buddhism in film. He also decided to join the project. This week, we shot a bunch of footage for a short film. "Throughout the entire process I have been amazed and in some disbelief at how this project is happening because 3 people share a common vision. Nobody is getting paid for it and there is no expectation to get paid for it in the future. There is no monetization in this project. It is only possible for as long as we get along on a human level, treat each other with respect and share a common goal." Tuning into offerings of subtler capital, Liam noticed, “things are dropping around me that I no longer need to clutch onto, and it is gradually freeing me up to want to be in service more and more. I’m sensing and searching for opportunities that are present, and seeing if I can amplify them.” From sticking up positive post-it notes around his city to engaging conversations around values with his family, he sure found ways to assume value everywhere, and ultimately transform each moment into a possibility for deeper connection. Our crew of spirited volunteers nurtured the space with their vibrantly visible and resiliently invisible presence. Melissa wowed us with her stunning and swift blog recaps as Nicole launched a Laddership Newsletter to nurture our field of growing alumni. Natasha dedicatedly dialed into the call even after a close family member was admitted into the hospital while Prasad didn't let a schedule conflict deter him from the call-- as he dialed in 23+ times while driving with spotty phone reception from one city in India to another. Pranidhi and Birju brainstormed ideas for evolving future rounds of the circles, and Nipun laddered us all with omnipresent selfless support. As our sixth week came and went, we all got the sense that it wasn't the end. :) Whether through Nikita's film or Shamash's museum, Varinder's online wellness portal or Parag's service-hearted management, Matt's circles of sharing, Harpal's kindness cafe and Little Book of Wisdom, Liam's "Everyday Gandhi" experiments, Alfred's spaces for collective wisdom and so much more-- as we engage along our various rungs of the ladder, each project becomes an excuse to practice our values and hold space for new patterns of positive design. After each Laddership Circle finishes, we find ourselves holding more questions than answers. 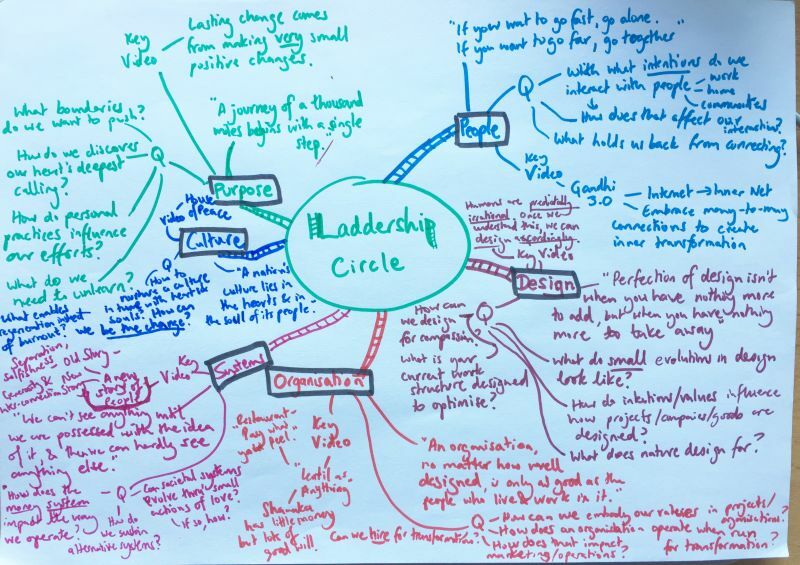 Yet something about the field that these circles sow leaves our minds resolved and spirits strengthened, as we continue supporting the conditions to shift our entrepreneurial efforts and ecologies towards leading with love. Awesome Audrey !! I am dumbstruck with the hard "Do Nothing" work you and the gang have put to get us together and anchored it so well. I am adding a sixth question which is obvious to all of us, what is driving Audrey and the whole gang to do this labour of love project ? The moment I hold this question and dive deep into it I have answers to all 5 question on Purpose,Process, Values, Be the Change and different forms of Capital. Superb, Thank you. Woooooooow Audrey!!! Thank you for this incredibly beautiful write up!! :-)))) looking forward to week 7's call! Big hugs! Audrey et al - a thought provoking space to hold.